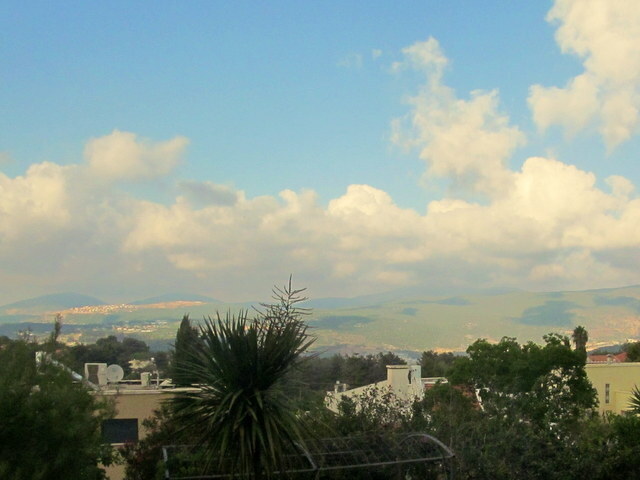 When I first arrived at this house in northern Israel, I gasped at the view, so instantly smitten was I. 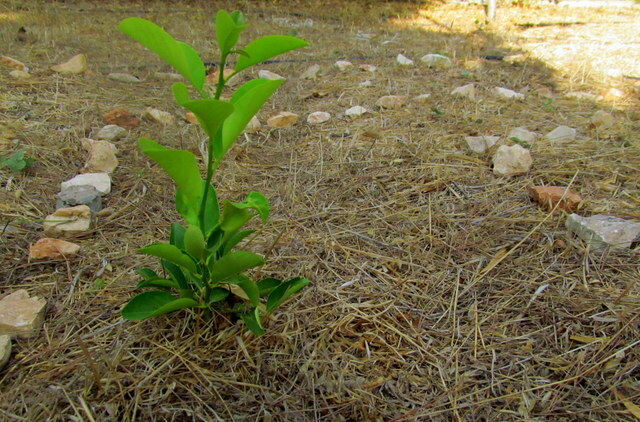 Then I spotted the garden below, a large patch of untended earth, covered mainly in dry straw and a handful of tall weeds; surrounded by fruit trees, a compost container and little else. An irrigation hose laid slightly into the ground in front. In the center, a solid metal trellis had been erected, through which grape vines would typically be woven; but in this case, other than a few glass baubles dangling, it was bare. The day after the owners handed me the keys, temporarily entrusting their beautiful home to me, I stood and stared down at that patch of earth. It’s missing something, I thought. Ahhh, yes, this space could really use a labyrinth. So I decided to install one, as a small gift to the owners. Meanwhile, I’d enjoy the creative process of making and using it for my own meditative walks – during much-needed breaks from writing. I scoured design ideas on the internet, knowing that a circular path (such as the one I’d made in Bali) wouldn’t blend into this environment, finally settling on a rectangular form. 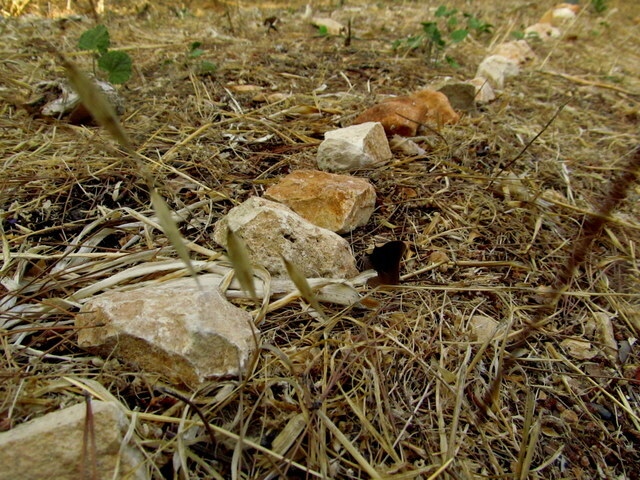 I measured carefully, set markers and spent days collecting stones from a forest nearby. I started to lay down stones. The ‘matzav’ (situation) down south progressively worsened. I’d lay more stones on the ground, and that evening I’d hear about sirens and more rounds of shelling, rockets and missiles. I stopped gathering stones for a day. Maybe the sirens will end. Maybe those rockets will be grounded. But nothing changed. Instability in the skies mirrored the obstacles and undulating terrain on the ground. While gazing down at the garden one evening from the hammock, a question crystallized in my mind: Could this swirling path in nature, above-ground, be my subconscious response to the nightmare network of tunnels that was being uncovered underground? Above and below, I was sensing a growing fragility in the earth’s surface. Cracks were showing. I felt rushed to finish. I wanted to walk. I wanted to pray and hope that this country’s ground could be cleansed. It was overwhelming. Nobody was using the word war yet, but that’s where we were heading. Crows and swallows flew abov e. A cat crept by stealthily. Military jets and choppers flew over. I resisted the temptation to stop. I laid a handful of stones. Then one soldier died. And another. The death count was rising, among Palestinians and Israelis alike. I kept putting down stones. I looked down at the garden for guidance. I didn’t know what I was looking for, but I finally found it elsewhere; on the news and the internet. The names of newly buried soldiers. The labyrinth was done. Out of a sense of sadness and angst, touched with helplessness, I started writing down their names. Just yesterday they had lives and plans and dreams and friends. Now they were faces – and names. Tomorrow, I leave behind this labyrinth, stones on the ground that I hope the owners will keep in place. The name and age of each soldier who’s died until today (as well as Palestinian names) is inscribed inside a separate folded square of paper. Each square is tucked below a stone, touching the ground. At best, it was illusory for me to imagine that this pastoral view, this garden sanctuary in the north, far from falling rockets and terrorists digging through tunnels, would insulate me from the worst. One of those fallen, a sweet-faced soldier with a boyish grin from this very village, was killed during a military operation in Gaza last Friday and buried here just yesterday. Now Guy’s name is on paper, under a stone on the ground, in a garden overlooking a breathtaking view. The vision was a labyrinth. A present. A meditation. Then it turned into a creative impulse, a catharsis. A tangible prayer for peace. That finally became, quite unintentionally but necessarily, a memorial. Oh…my original comment just disappeared. Thank you Aj for sharing this and creating this spot up North. I do hope N. keeps it in her garden. I Also wanted to share what we talked about last week. Remember: Unless you LIVE or HAVE lived IN Israel, or even visited for a while …..( to quote a popular israeli song) “Dvarim sheh royim mi sham, loh royim mikan”- the things that you see from there, you dont (or cant) see from here. Safe travels in Israel and when you leave. Peace. Breath. Talks. Pray. Hope. Oy. So profound. Where are you going next? This is poignant and apaling…how life somehow progresses amid unspeakable horrors…feigning normalcy when nothing makes sense. Your way of honoring your own distress and that of a country being ripped apart and bombed into oblivion is deeply moving. Makasih. Perhaps it’s more like ‘striving’ for normalcy… insisting on it. Better than being paralyzed by fear and so much uncertainty. I guess aba sent it to me. how poignant. not a dry eye, when I read it. is it ok if I send it on to a few of our friends? love you, ima and may you have a HEALED AND PEACEFUL DAY. I could not say better what those have said before me. A very deep experience. Such meaning you created there. Thank you for writing it down, so contemplatively in the midst of chaos, and sharing. Very very sad. Where are you going next? After the 2 weeks? I’d not heard of a labyrinth before (have since flicked over to your Bali post – stunning! ); what a powerful journey you went through with this one. Labyrinths have such healing power. How wonderful that you could can create your own and pay homage to the fallen soldiers in such a way. Inspiring, touching and thought provoking. They do indeed Kim! Have you walked any labyrinths yourself? I feel that the whole process unfolded just as it was meant to, and a rather cathartic one at that. I suppose the process of making a labyrinth is similar to walking one, you simple follow your thoughts, your steps, the hands that lay the stones wherever they may go… I have fond memories of walking a labyrinth in the Coromandel, New Zealand. It was set high up in a beautiful, secluded spot that overlooked the ocean. I found it to be a wonderfully nourishing and healing experience. I also used to work with young people on week long leadership courses, on the Isle of Skye, Scotland. The participants would walk a labyrinth on the final evening. We’d all meet in the middle and sit in silence around a big open fire, content in our thoughts, reflecting on the week and what we’d learnt. It was often very moving and magical just being there together, supporting each other as the stars came out. Now I’m feeling nostalgic!